The Košice Peace Marathon has received another prestigious award. The International Athletics Federation awarded it a stamp of quality in the form of an IAAF Silver Label for achieved sporting results and overall organization. The umbrella athletics organization awards this certificate to marathons and road races based on the evaluation of precise criteria, and after last year’s bronze placing, this is for the KPM another major shift forward. The path to the highest gold stamp is not beyond reach; indeed, several parameters have now been fulfilled. 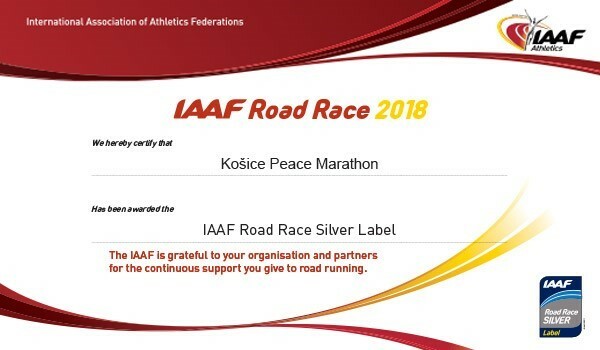 We note that in addition to perhaps its most valuable mark – the unique position of the oldest marathon in Europe – the Košice Peace Marathon takes pride in the 5 Star Quality Road Race certificate, which was awarded to it several years ago by European Athletics. What to look forward to in 2019?